Home › Liv Olteano › The Heracian Affair: expected publication March 20 2013! Yes, I am utterly delighted to finally announce we have a date for when Rizzo and Conrad will be unleashed unto the unsuspecting world 😀 Be afraid, be very afraid! You can check it out for yourselves over at the Dreamspinner Coming Soon page and see it in all its glory on The Heracian Affair‘s page. The title is already up on Goodreads here. Yes, I am extremely excited and cannot wait for March 20. This might be longest month of my life. It’s a m/m space opera adult romance (of the hot variety, lol!) with some sprinkles of ex-military/military and kink. Expect quirky characters, bubbly chemistry and a lot of teasing. And a happy ending, because sometimes I’m just that much of an incurable romantic. Are you ready for Rizzo and Conrad? 😀 Because they’re finally ready for you. 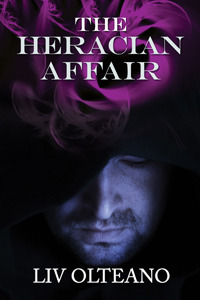 ‹ The Heracian Affair: we have a cover!